John Hench (June 29, 1908 – February 5, 2004) was an employee of The Walt Disney Company for more than 65 years, during which saw the creation of nearly every Disney animated feature and theme park. Born in Cedar Rapids, Iowa, Hench attended numerous art and creative schools across the country, including the Art Students League of New York, the Otis College of Art and Design in Los Angeles, the San Francisco Art Institute in San Francisco, and the Chouinard Art Institute in Los Angeles. Starting in 1939 as a story artist, he weaved his way through the animation department working in areas including backgrounds, layout and art direction, effects animation and special effects. Hench was respected by Walt Disney as one of the studio's most gifted artists and teamed him with Salvador Dalí on the animated short Destino, a project begun in 1945 that was not completed and released until 2003. 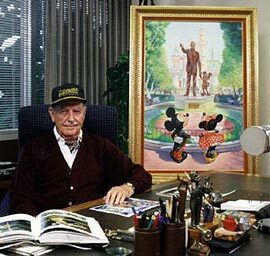 Hench was also Disney's "official portrait artist" of Mickey Mouse, painting the company's portraits for Mickey's 25th, 50th, 60th, 70th, and 75th birthdays. By 1954, Hench was in the studio's live action department, as lead developer of the hydraulic giant squid in 20,000 Leagues Under the Sea, helping to win an Academy Award for Best Special Effects for the film. Afterward, he moved to WED Enterprises (now Walt Disney Imagineering), to design attractions for Disneyland. Hench went on to design many iconic elements for Disney's theme parks, including Cinderella Castle at Magic Kingdom and Tokyo Disneyland, Space Mountain, and contributed to attractions such as the Mickey Mouse Revue. Because of his resemblance to Walt Disney and his frequent visits to Disney theme parks, he was often asked to sign autographs and pose for pictures with park visitors who mistook Hench for Disney himself. In 1990, he received the Disney Legend award, the company's highest honor, presented to him by Michael Eisner. Hench continued to maintain an office at Walt Disney Imagineering headquarters in Glendale, California and worked there daily up until a few weeks before his death. His name tag and 65-year service award are prominently displayed in the building's lobby, and tributes by fellow Imagineers line its hallways.